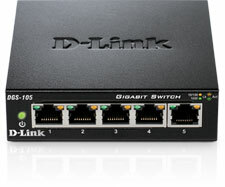 With data transfer speeds of up to 2000 Mbps on Gigabit Ethernet, the D-Link DGS-105 5 Port Gigabit Switch is ideal for transferring files quickly. Featuring easy access front Ethernet ports with bi-color LED indicators per port to quickly distinguish link status. The DGS-105 switch features IEEE 802.1p QoS, which organizes and prioritizes time-sensitive and important data for efficient delivery, allowing for smooth streaming media, VoIP calling, and online gaming. Additionally the DGS-105 switch features a Kensington Security Slot on the rear panel where users can fasten the unit to a table or desk. 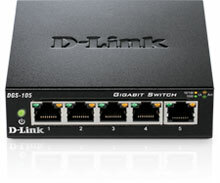 The D-Link DGS-105 is also known as DGS-105	or DGS105	.